In case you don’t believe the narrative of cops killing blacks indiscriminately affects the community, check out this. 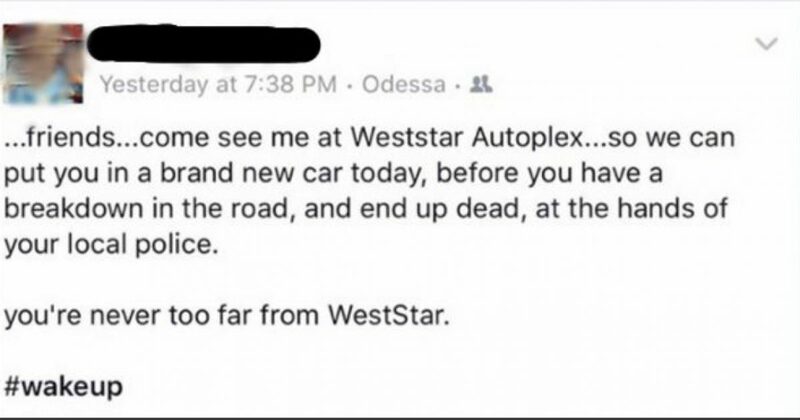 It’s a Facebook post from an Weststar AutoPlex, a car dealership in Texas. Since the post was removed and the face blurred out, you can’t tell the race of the employee. But does it really matter? Considering the false narrative that police target blacks, the ad could be considered discriminatory. Nevertheless, what we know is this employee is yet another uninformed Liberal. And as is typical with Liberalism, this employee wants to profiteer on the lie. 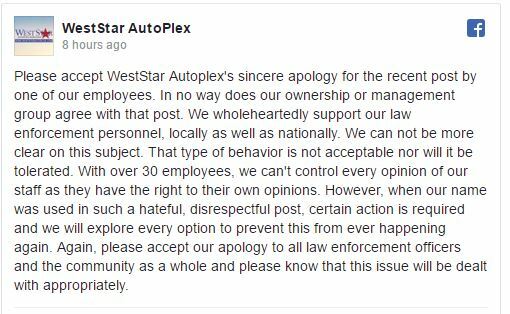 I’m happy to report that Weststar AutoPlex fired the employee. I hope the company will make a significant donation to the local police department’s benevolent fund. As for the rest of America, you have witnessed what happens when we ignore the Left. Their views become pervasive, and we are left to deal with the inevitably horrible aftermath.